Wearing a size 11 (sometimes a 12) makes it so hard to find fashionable, quality shoes. Nine West is one place that I can depend on! Their fall collection is amazing and they are doing a better job of staying on trend. (They're kind of matronly sometimes!) 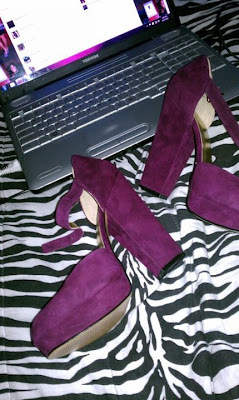 I added the "Aroundtown" pink suede platforms to my wishlist on the site last month. When I went into my local store at the Four Seasons Mall, I was so surprised that they even had them. I decided on the dark pink ones because I need a statement shoe instead of my usual black. OMG! I love these...bought some this color in a lace up wedge heel. These will be lovely on you! What were the other colors? I love these...I wear an 11, too, and it is totally hard to find cute shoes! I love heels, but size 10 either pinches or squishes my toes....I def have to take a closer look at these!